Help Monitor Least Terns at Venice Beach! The California Least Tern is listed as endangered by both Federal and California state authorities, and Los Angeles Audubon Society is looking for dedicated volunteers to help monitor them at Venice Beach. In Los Angeles County, this species has only two breeding colonies: Venice Beach and the Port of Los Angeles. 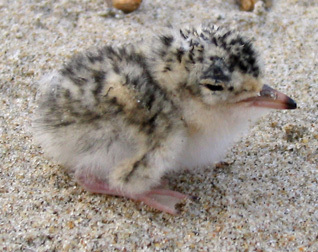 L.A. Audubon works with project biologists and the California Department of Fish & Game studying the tern colony in Venice by coordinating a community-based science monitoring program during the nesting season. Volunteers receive training and then help monitor the colony for one hour each week from mid-April to mid-August. This is a great opportunity for families looking for a way to learn about nature together, for students looking to gain some field experience in environmental science, or anyone who’d like to know more about urban wildlife. Many Santa Monica Bay Audubon chapter members have volunteered in previous years. Monday, April 26th, 6:30 p.m. to 7:30 p.m.
Saturday, May 1st, 9:00 a.m. to 10:00 a.m.
Training Location: The sessions will take place at the Least Tern Colony enclosure on Venice Beach, located a few short blocks north of the Ballona Channel at the southern end of Venice Beach. There is metered parking along the channel where Pacific Ave. turns into Via Marina, and there’s a public pay lot at the intersection of Via Marina and Captain’s Row. There’s free parking along Pacific Ave. but the spots disappear quickly. Volunteers need attend only one of these sessions, though you’re welcome to attend both. Binoculars are essential to monitoring, so please bring them with you if you own them. If you don’t own any, they can lend you a pair for the season. If neither of these dates work for you, please let them know and they’ll see if they can arrange an alternative training session. Questions? Please contact the Volunteer Coordinator at (323) 481-4037 or email: tern@laaudubon.org.